The first thing you are going to want to do, is sand your wood. The laminate is going to be mostly smooth, but just make sure to sand the edges and any areas that aren’t nice and smooth. I just did a light sanding, nothing you need to put a whole lot of elbow grease into. Now for the fun part, staining! 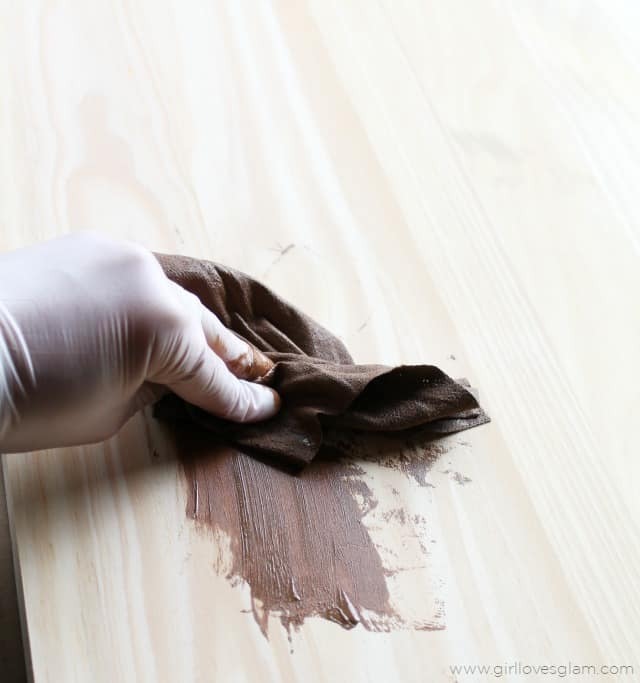 Staining wood can sound like a scary process, but these Minwax Wood Finishing Cloths are seriously the coolest! If you have ever used a Clorox wipe, you can stain wood. You literally wipe the stain on with the cloths. Just wipe in the same direction as the wood grain and make sure you have covered all of the wood. Then go back and wipe the stain off with a paper towel. It says that it takes an hour to dry, but mine was sitting in the sun and didn’t take that long at all. Measure how big you want your stripes to be and tape them off. 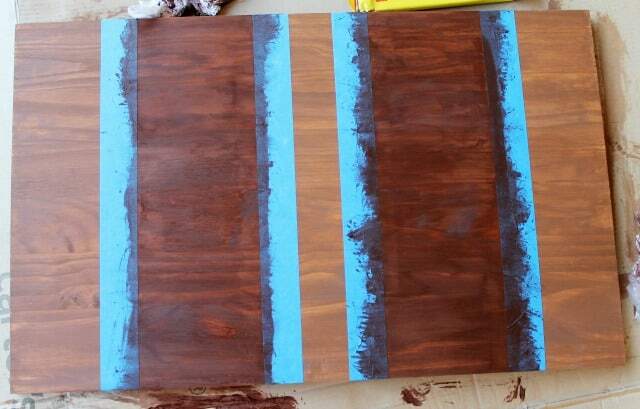 I wanted to have two darker stripes that were 6 inches each, so that is how mine is taped. Now, wipe your darker stain where you want your stripes to be. 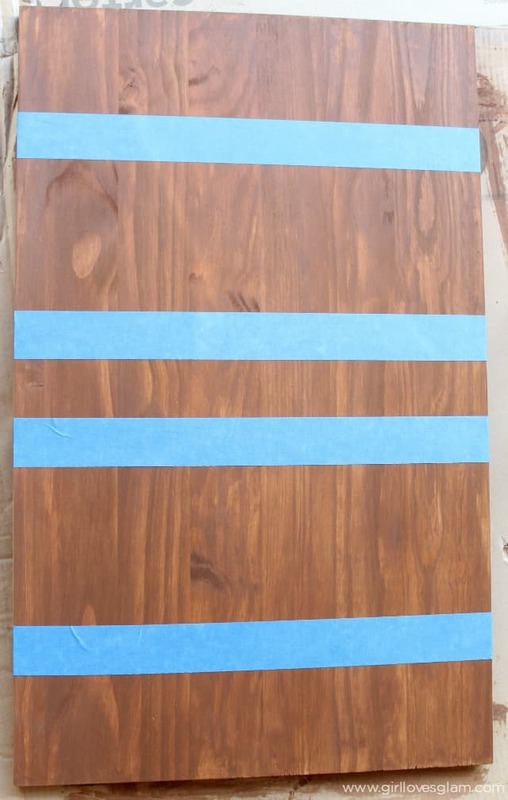 You may need to wipe sideways, instead of with the wood grain by the tape, but just make sure to go back and wipe with the grain afterwards so that when it dries, it is all in the same direction. After you have wiped it on, wipe it off with a paper towel and let it dry before taking the tape off. 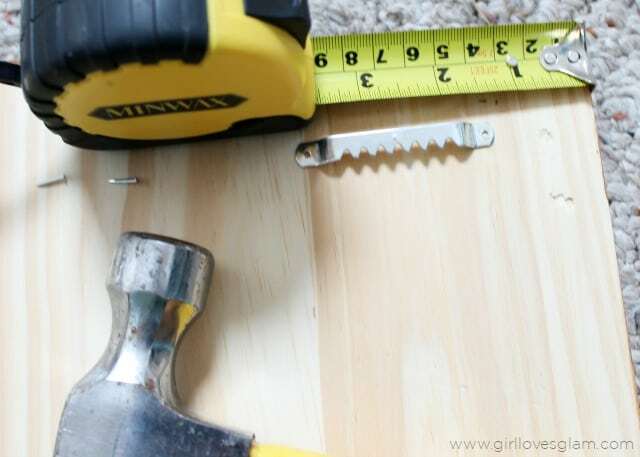 Flip your wood over and measure a spot for your hangers to go. I put mine at 1 inch down and 1.5 inches over. Nail them into place. Just a tip, if your wood is thick enough, use longer nails when you put them in. The tiny nails they give you with the hangers are kind of hard to get into place because they are so short. 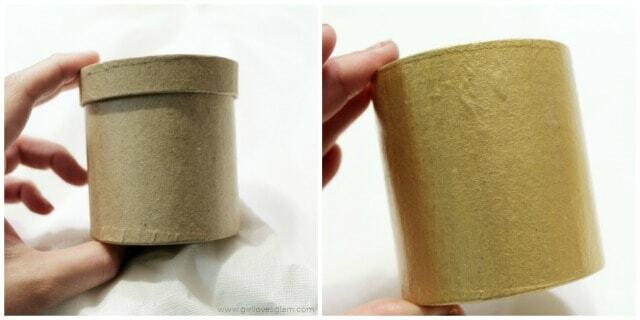 Paint your paper mache box and throw the lid away. Props to you if you can think of something creative to do with the lid. Print off all of your printables. I printed all of mine off on white cardstock. Click on each of the links to get the printables. There is a link to my cleaning list and blank cleaning list if you want to open it up in one of your computer programs and add your own chores or even just write them down with a marker. These printables are very similar to the last ones, but I wanted them to feel more modern. I went with a hexagon theme because it is trendy, but these printables are really easy to switch out when I get sick of them. I also decided not to make grocery list printables this time and just have a notepad on my board because I use a list making app for my grocery list and found myself using the grocery list papers as scratch paper anyway. If you would like any of these printables customized, I recently added a listing on my Etsy shop for customization of these printables HERE. Put the printables in the picture frames. Rip the stands off of the backs of the picture frames. 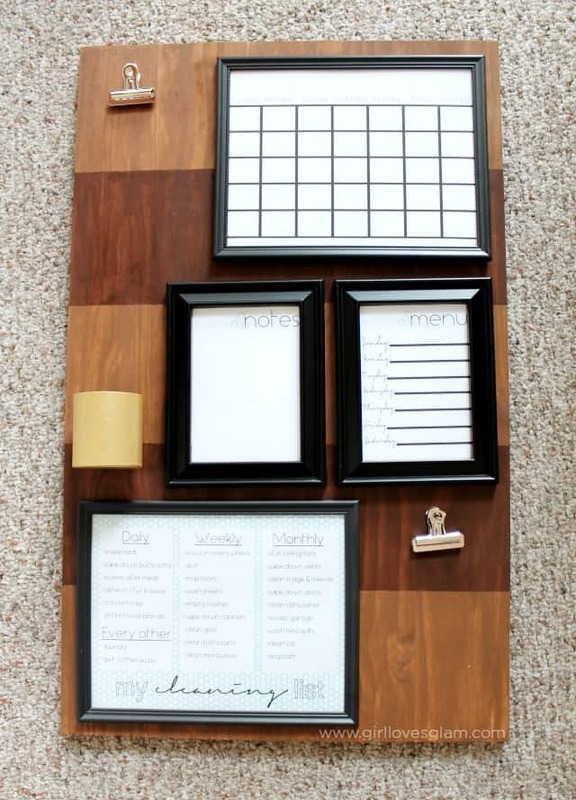 Lay out all of the frames on the board with the paper mache box and clips to get them right where you want them to be. 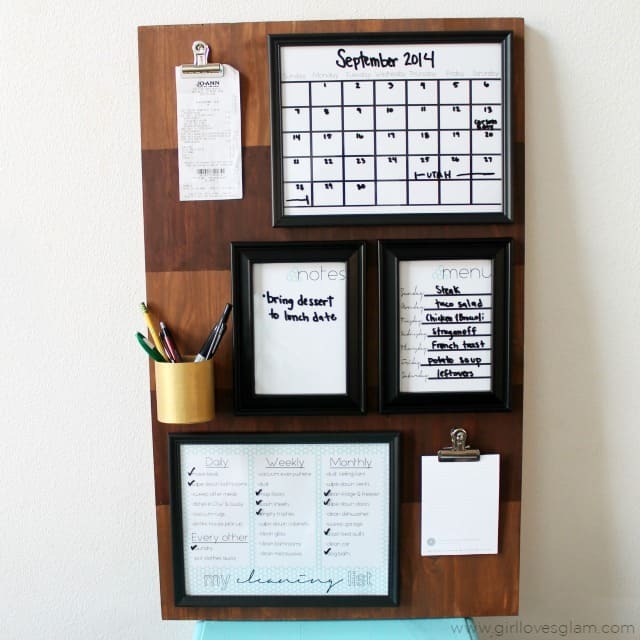 Put two of the picture hanging command strips on the top corners of each of the frames and stick them to the board where you want them to be. Put two regular command strips on the flattest side of the paper mache box and stick it to the board. 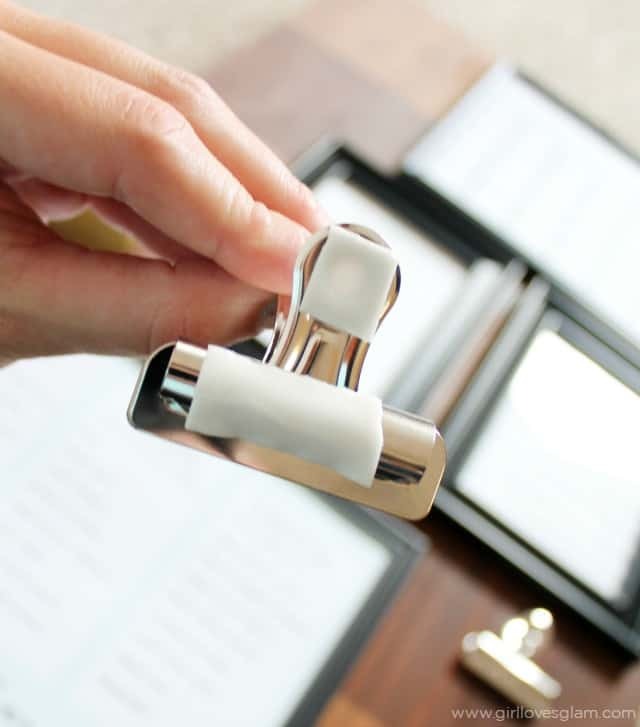 Cut up a command strip and stick it to the back of your bulldog clip on the top and on the clip part and stick them onto the board as well. 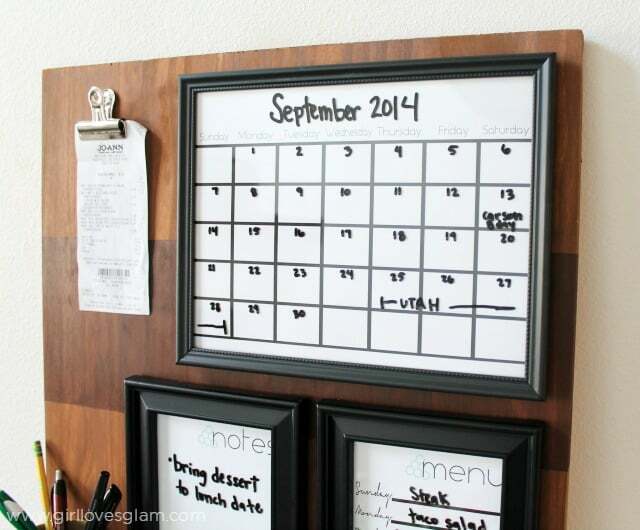 Hang up your board, put your notepad in one clip, your pens and pencils in your box, and start organizing! I love that this gives us one space that has our family calendar, a clip to put our receipts and bills on, a dry erase note pad, our weekly menu, our cleaning list, our writing tools, and some scratch paper all in one place. I love how much more modern the printables look with the hexagon theme and the seafoam green color that the hexagons are in this time. 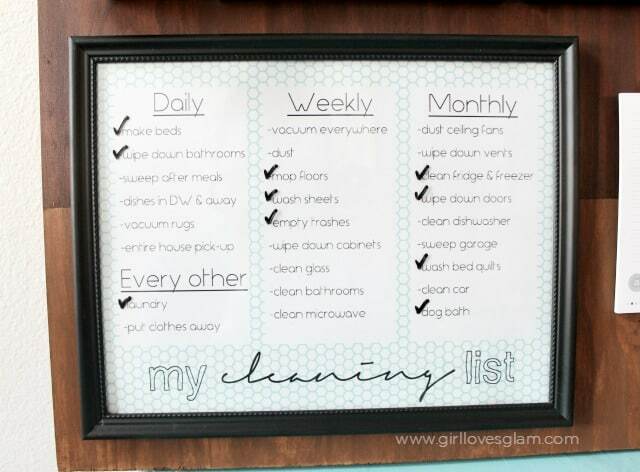 This cleaning list is literally how I function! I find myself getting too busy to clean unless I have a list there to tell me exactly what to do. It is great because my daughter loves to help me check off chores on the list too. It helps teach her responsibility that way, even if she is too little to do most of these chores on her own. And there you have it! Organization Board 2.0! 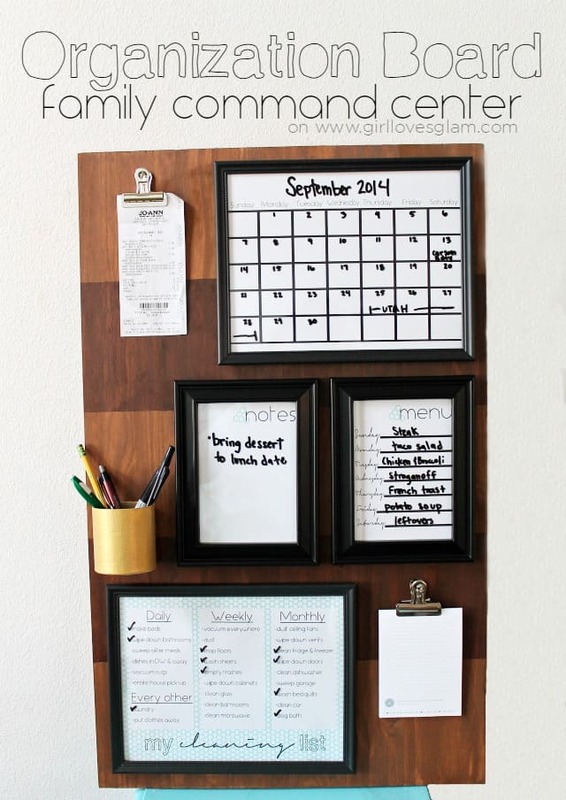 How do you keep your family organized? I read many of your comments from your 2012 message/organization board, and I am wondering how well it works to use a whiteboard marker on glass. Could you share that? Your newest message board is very cool. Thanks. The dry erase markers work incredibly well on glass. 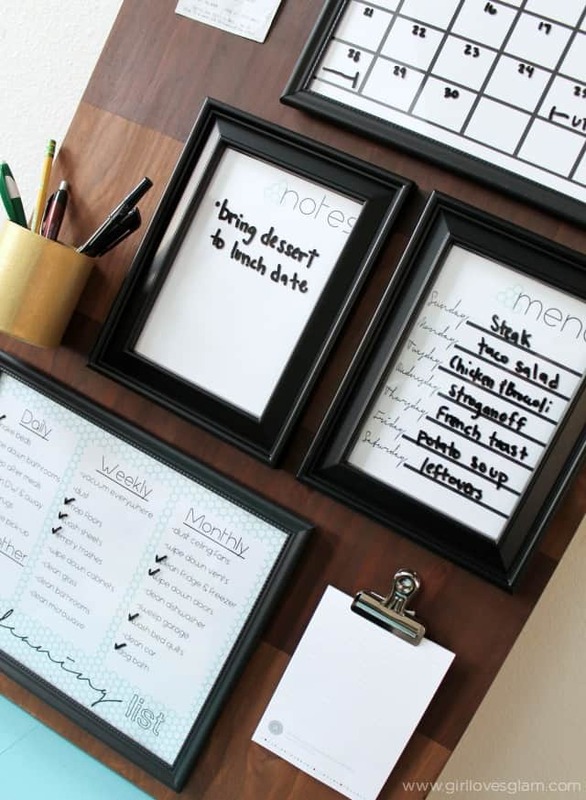 It works exactly like a dry erase board, actually it may be better than a dry erase board because I feel like dry erase boards leave residue that you can see where you have written and the glass doesn’t even have that. It is great! Love this idea and definitely going to give it a go. 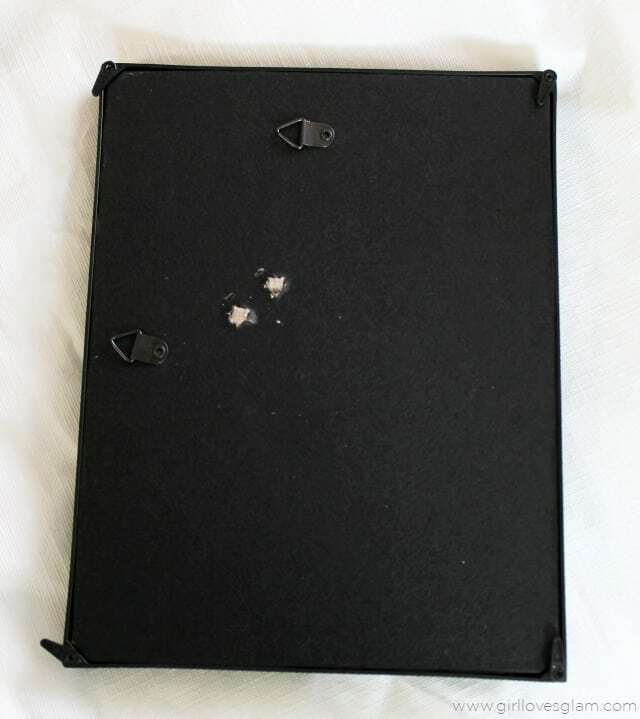 For the lid of the box, I have some old magnet sheets that I would trim to size and stick inside it to hold paper clips or other little metal things. Either stick it to the board or place it on my desk. This is exactly what I thought to do with the lid. I love the update you made to your original version! The idea behind it is fantastic! Hi! This is amazing and I am currently working on one of my own! I was wondering what font you used for these lists? Also is there a way you know of to get the empty chores list into word so that I can use the same font and print up my own list? Very fantastic tutorials and I am so grateful for the printables!! The font is called Aspergit. I don’t know that you would be able to do that on Word, but I know you could on Microsoft Publisher that usually comes with Windows Office. This is a great idea. I love it. My oldest son just moved out. I am making one for him. It will keep him organized. He especially needs the chore list. It was probably about $40-$50, but I didn’t cheap out on anything. You could get a less expensive piece of wood if you are worried about the cost. Where do you get the wood? Also, are your measurements correct? I think -Laminated pine cut to 30.5″ x 19″ would be 30.5 ft x 19 ft. 30.5″ x 19″ would be inches. Thanks! I got mine at Home Depot. The font that I use on my blog is fairly small so it is hard to see the difference between ” and ‘, but it is ” up there, meaning inches. I would just hope that if people see it they would use their common sense to know you wouldn’t want a 30 foot board in your house. I am currently making this for a Christmas gift and was wondering how exactly you used the paper mache box. Was it deep enough to hold pens? Did you cut it in half, to make a semi-circle, so that it could be affixed to the board? I can’t quite tell from the pictures. Thanks!!! Yes it is deep enough for pens and pencils. I didn’t cut it or anything, it just is connected to the board with command strips! So happy you made this new one, it looks great! I followed the chevron design from Pinterest today, thinking I could just paint it different colors, because I have never been in the chevron craze. Definitely going to follow this design! Thank you for this! Your tutorial is wonderful. I want to do this almost exactly – but I would like to add an ever changing to-do list. The only issue I can for-see is being able to write easily while up on the board. Do you think you could Velcro on a frame? Or be able to tKe a paper in and out somehow? Hey, so these are actually attached with the picture hanging command strips. They are basically just like velcro! They would work for that! Can we buy this somewhere? I would love to have one but don’t have the free time to make it myself. I used to sell them, but it isn’t cheap to ship these! It was costing almost as much as it was for me to sell them as it was to ship them. I would recommend finding someone you know to make it for you. Hi, I’m the random dude. Has anyone tried using Velcro instead of the command hooks for this? Seems like it would be cheaper and keep things more secure and flushed. It wasn’t hooks that were used. They are the Command Picture Hanging strips. 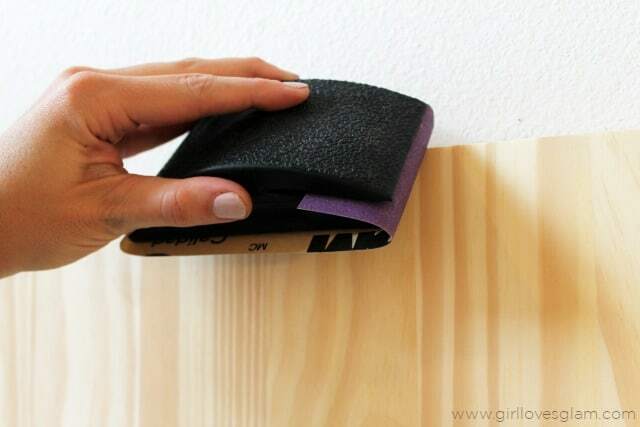 They are basically just like Velcro, only they are made specifically for hanging pictures and won’t ruin your surfaces you are putting them on and are strong enough to handle pictures. For the cover to the box, I would pick up one of the clock kits from the craft store, and add a little clock to the board. Love your talent, and will be making these as gifts. your idea is amazing! I just wanted to let you know not to put down your earlier effort – chevrons are back in fashion again! This is probably a dumb question, but how did you print a 5X7 menue and notes page and then an 8.5 X11? I am not sure I understand your question. I just printed them all at home onto an 8.5×11 paper and cut them down to size. I am not sure if that is what you are asking though! I designed that myself. I suggest taking the original photo and putting a white square over the words you want covered up and putting the word “goals” on top of that square so it all matches. Trying to print these by using the links, but they won’t open. It only says “page can’t be displayed”. Tried going to pinterest & printing from there with same result. Tried downloading but it won’t work either. Beyond frustrated. Is there another way to get the links? That is so strange! I just clicked on all of the links and they worked for me. Can you try again? I am wondering if some part of the program I used was down when you tried before. Sorry about that! I absolutely love your ideas! I am in the process of working on a command center for my family and may use some of these ideas in the future! What a great post! 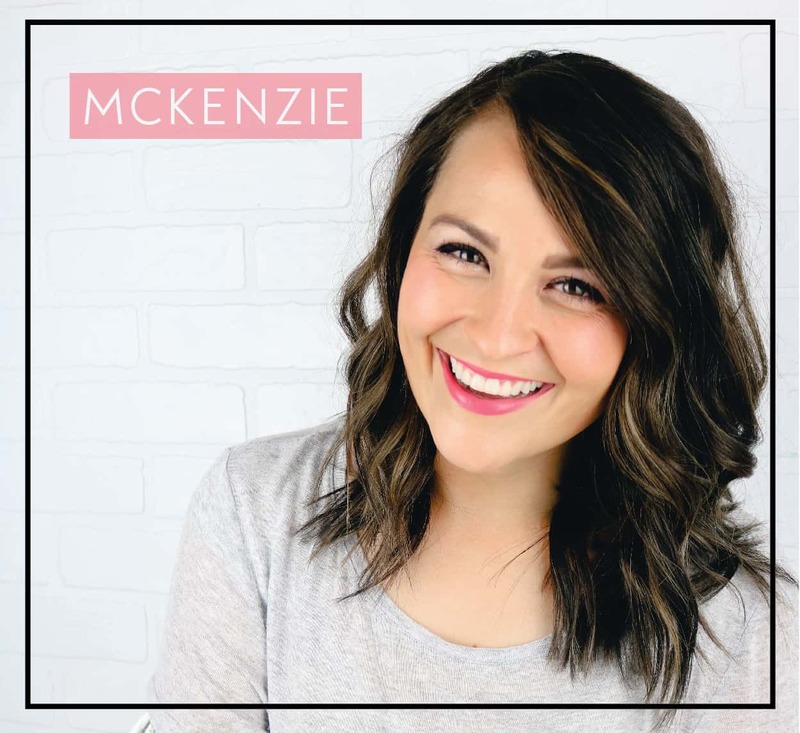 I love those printables! 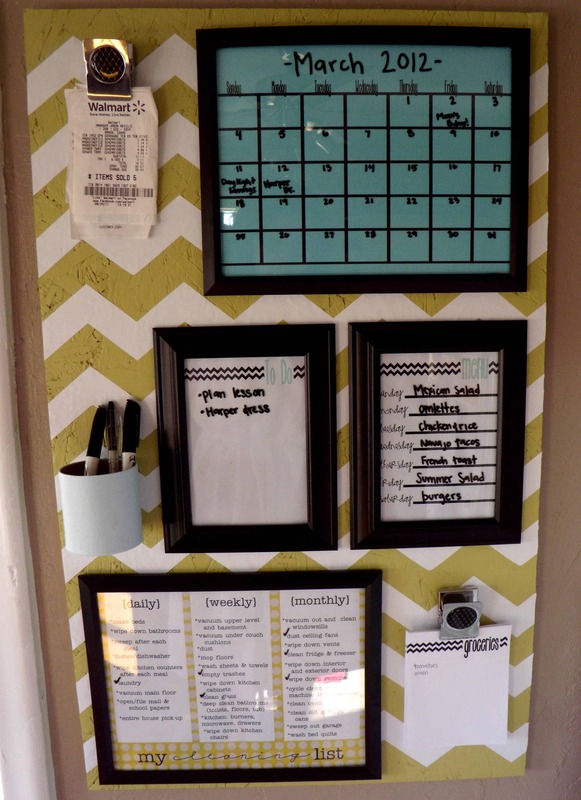 I’ve been looking to do something like this in our dining room (since it’s where the door we use to exit the house is located). 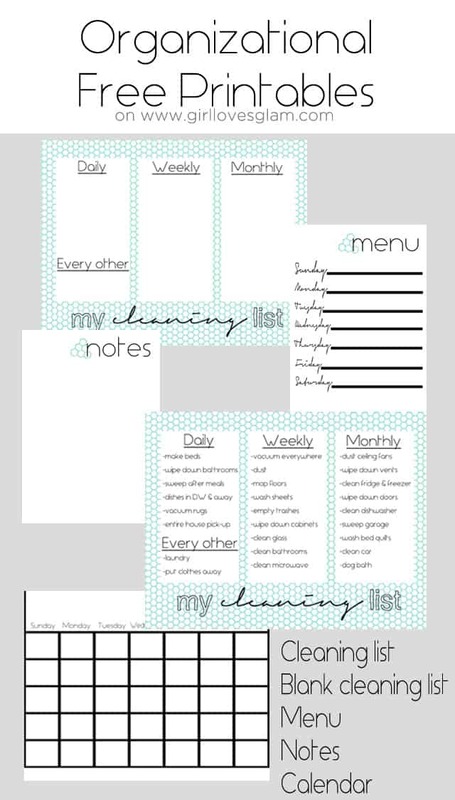 I think I’m going to add the weekly menu thing and a place for our cleaning list. Thank you for the inspiration! I tried to go to your site to print what you offered but there is nothing at that site. Oh you’re totally right, I’m sorry! It looked like a ‘ on my computer but now that I’m on my cell I can see it. Sorry! It’s a gorgeous board!